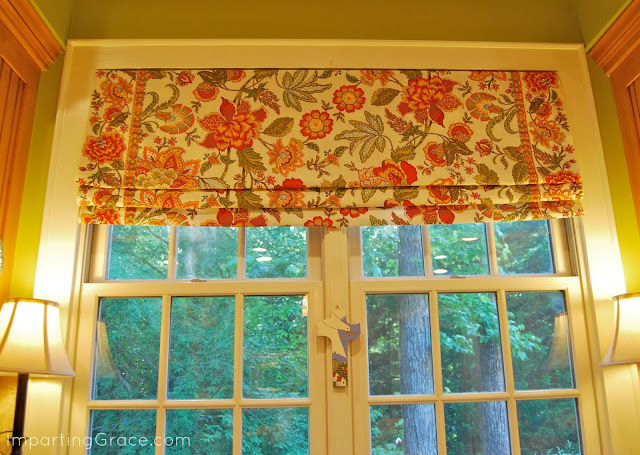 This spring I made a new faux Roman shade for my kitchen window, and I love the new look. 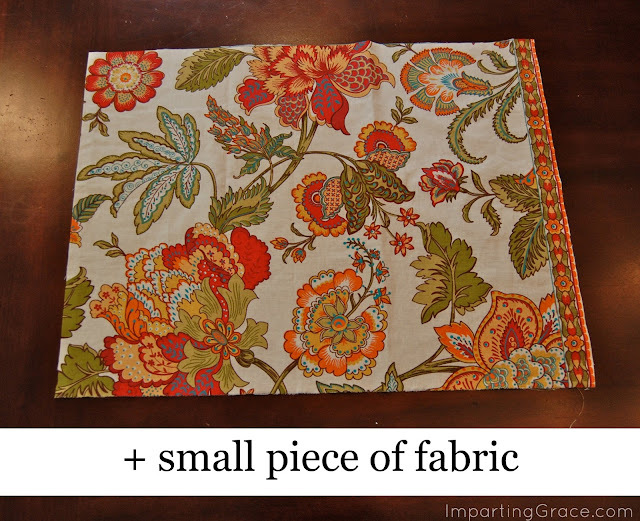 This particular shade I made from a tablecloth, so I had extra fabric left over. Of course I saved the scraps--do you do that, too? A few days ago it occurred to me that I could use those scraps to make pillows for the new captain's chairs in the breakfast area, adding a bit of coordination between breakfast room and kitchen. So I made them. Out of scraps. For free. I followed this tutorial for making a no-sew bolster pillow--it's really simple! 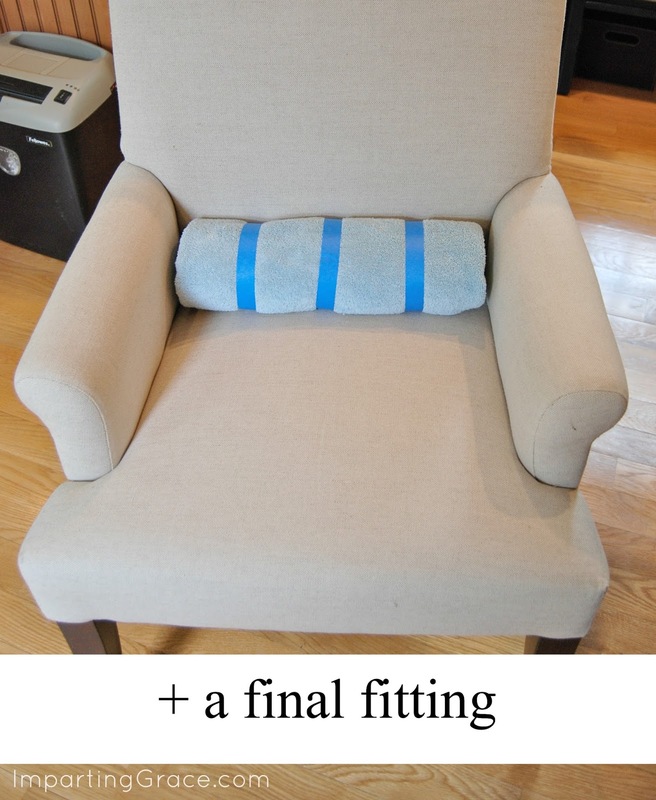 Adding a covered button to the end makes the pillow look finished. I had the covered button kits in my stash, so my total cost for this project was $0. Zero. Nothing but a few minutes of my time. 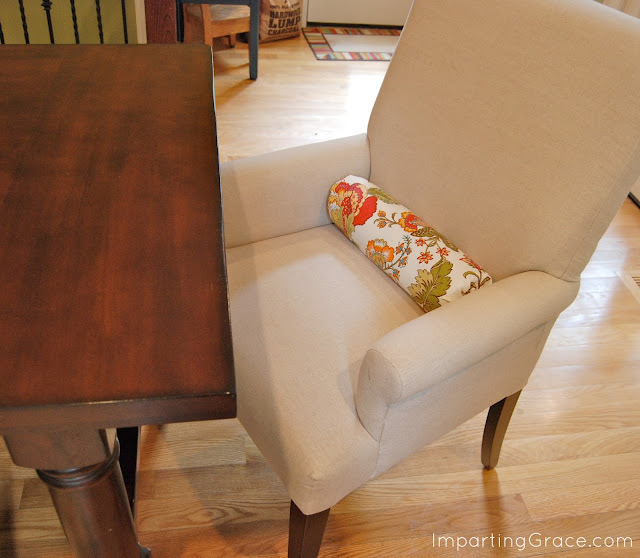 It took me much longer to take the photos and write this post than it did to make the pillows! Now the captain's chairs sport colorful little pillows that coordinate with the kitchen window treatment. You could make much bigger bolster pillows using this same method. I didn't want the pillows to get in the way of the person sitting in the chair, so I purposefully made them kind of skinny. Do you have any chairs that could use a little splash of color? 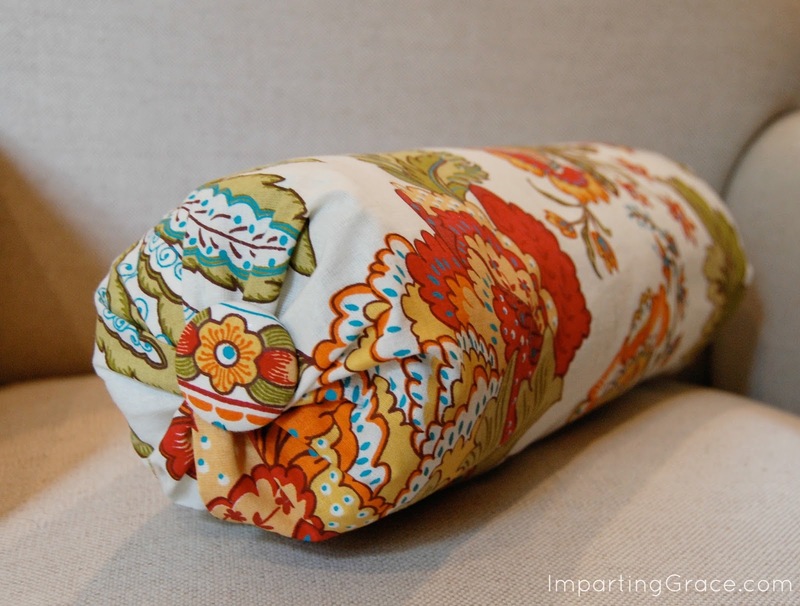 Check out your fabric stash--you could be well on your way to custom-made pillows! You are truly the most creative one! 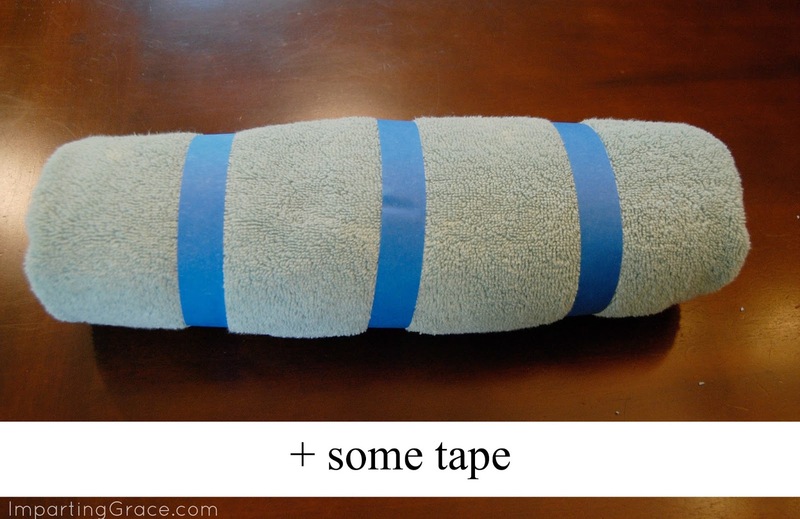 I've rolled up a towel before for an insert but never secured it with tape. I love that. Your pillow turned out so pretty! Hope you're doing well, oh beautiful one. Very pretty - and anything no-sew catches my attention! 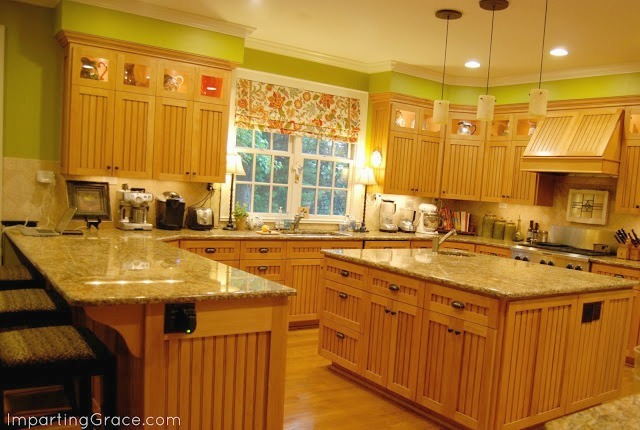 what a great way to add a splash of color and tie your chairs in with your kitchen areas! I love your kitchen and the Roman shade is to die for...I've been lurking and noticing from afar :) I NEVER throw away scraps of fabric unless they are tiny. The pillows just make those chairs! You are AWESOME!! Love the no-sew approach!! Perfect! You are so creative. The pillow and shade are beautiful. 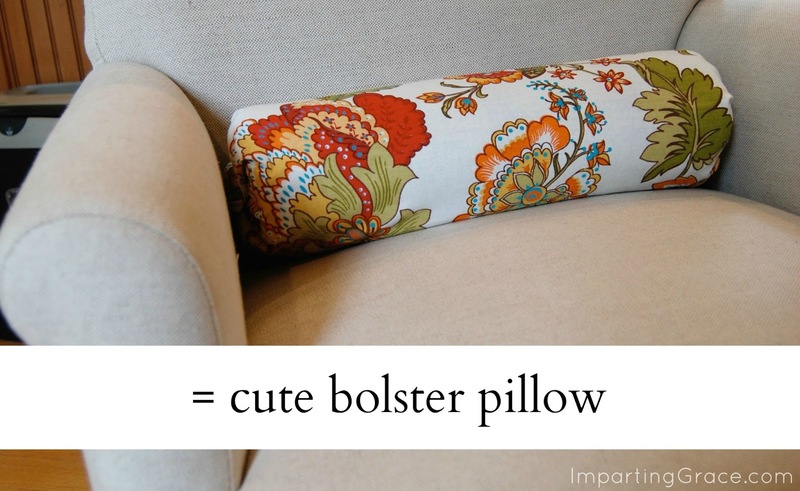 I've always loved the look of bolster pillows. You're so clever to use a rolled up towel! 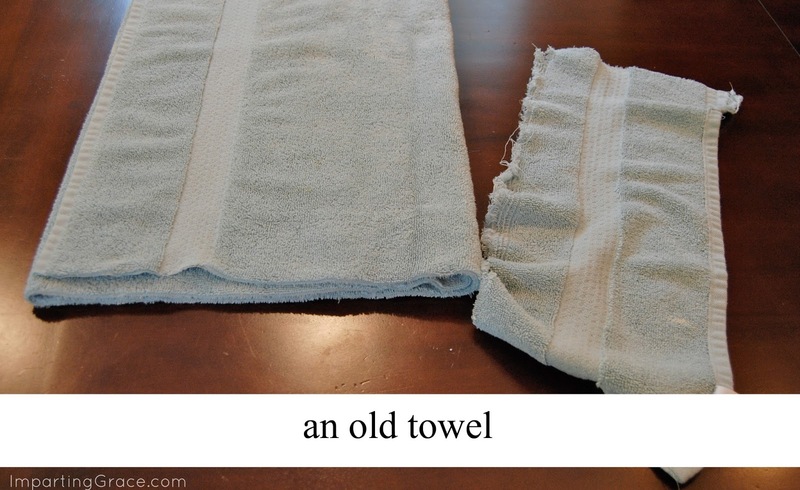 I always have tons of old towels on hand. :) Thanks for sharing this neat idea! Very creative! Your projects look so cute and who would have thought to use a rolled up towel?! Omg.. such a simple procedure for a beautiful pillow.very creative idea. That is the most creative thing I've ever seen! Wonderful for someone like me who doesn't sew a lick.